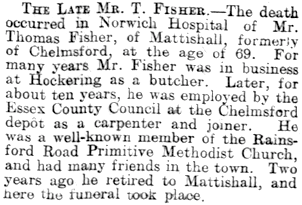 Thomas Donald Fisher (usually known as Donald) was born and brought up in Norfolk, the son of a butcher. At some point between 1911 and 1917 he moved to Chelmsford with his parents and siblings. During the war he served in the Essex Regiment and he was killed in action in April 1917. His home was in Cramphorn Road. A cousin who also lost his life in the war is commemorated at Chelmsford. They made their home on Chelmsford’s first Council housing estate, off Rainsford Lane at 42 Cramphorn Road. Donald’s father worked for the County Council as a carpenter and joiner. 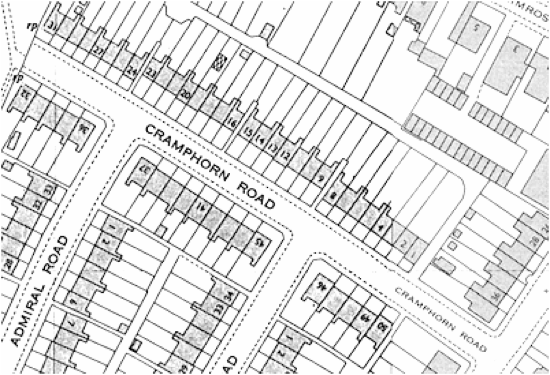 Cramphorn Road was swept away as a result of redevelopment in the late 1960s. During the war Donald enlisted at Chelmsford and served as Private 33940 in the 11th Battalion of the Essex Regiment. Donald was killed in action on 17th April 1917 (according to the Commonwealth War Graves Commission). He was aged 21. On 4th May 1917 the Essex County Chronicle contained a typical (by that stage of the war) short report on Donald’s death. Donald was born in 1895 in Hockering in Norfolk, a village about ten miles west of Norwich. He was the only son of Thomas Fisher (1863-1931) and Georgina Fisher (nee Gath) (1863-1926). His four siblings were Clara Evelyn Fisher (born 1890), Emma Margaret Fisher (born 1892), and twins Ida Sarah Fisher (1901-1978) and Ivy Sophia Fisher (1901-1993). 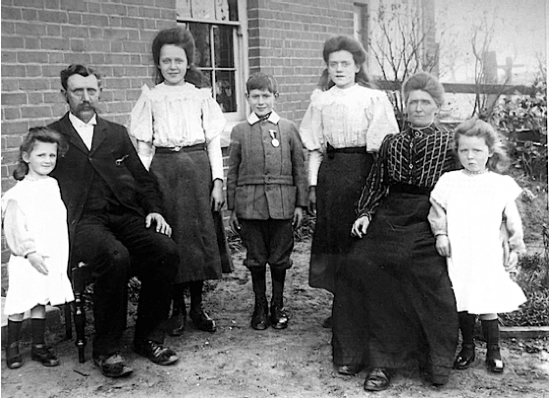 In 1901 the census recorded Donald, aged 5, living with his parents and two younger sisters at The Street in Hockering. At the time his father was a 37 year-old self-employed butcher. A decade later the next census found 15 year-old Donald assisting with his father’s butcher business in the same village. He was accompanied by his father, then a butcher and dealer, and his two youngest sisters. Ivy Sophia are extreme left and right, though we do not know which is which. 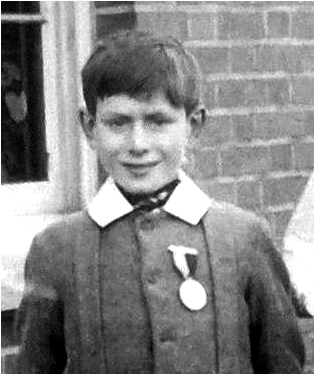 Donald is proudly wearing a medal, thought to be for good attendance at a Primitive Methodist Sunday School - the award of which may be the reason the photograph was taken. In the years between that census and 1917 Donald came to Chelmsford with his parents and sisters. His uncle, George Fisher, had moved his own family to the town from Norfolk prior to 1911, and it may be the town’s better employment prospects encouraged Donald’s father to bring his family south too. Today Donald rests at Philosophe British Cemetery, Mazingarbe, Pas de Calais, France (grave II. N. 2.). The cemetery was started in August 1915. In 1916 it was taken over by the 16th (Irish) Division, who held the Loos Salient at the time, and many of their dead were brought back to the cemetery from the front line. Succeeding divisions used the cemetery until October 1918, and men of the same Division, and often the same battalion, were buried side by side - Donald lies beside a comrade from the 11th Battalion, Essex Regiment who died the same day as him, and another from the Royal Engineers who also died the same day.After the Armistice, this cemetery was one of those used for the concentration of isolated graves from the Loos battlefield. The bodies of 41 men of the 9th Black Watch were brought from positions a little West of Loos, and those of 340 officers and men of other Regiments from different points in the communes of Cambrin, Auchy, Vermelles, Halluch and Loos./ The cemetery is also the burial place of Charles Edward Brown. Donald is commemorated by the Mattishall war memorial in Norfolk. However, he is not commemorated by the Chelmsford Civic Centre War Memorial, though his cousin, Leslie Albert Fisher is. Donald’s sister Ivy Sophia later married William George Chilvers, whose brother Ernest James Chilvers is commemorated by the Chelmsford Civic Centre War Memorial. The 1918 register of electors listed Donald’s parents at 42 Cramphorn Road, Chelmsford. His mother died in 1926.